I’ve been aware of Chiropractic since childhood as it helped my grandmother manage her migraine headaches. I’ve now been a Chiropractor now for almost 25 years, graduating in 1994. I worked in Kent for a year before joining Graham Heale in Hertfordshire where I built on my training for the next 5 years. In 1999 I moved to Poole. I like to keep updated with developments in Chiropractic, sports injury rehab and also general medicine as well. All health professions are constantly evolving and developing and Chiropractic is one of them. There have been many changes in approach over my career and I have developed into a better physician by adapting my practice to reflect this. I firmly believe that Chiropractic’s potential for Sports performance is under developed. My keen interest has helped many athletes perform at their true potential. 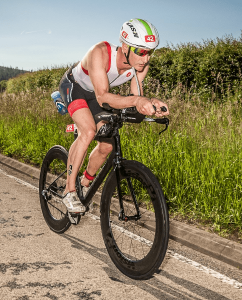 Being an amateur Triathlete has helped my knowledge of sports training immensely (read my triathlon story here). The thing that I like most about Chiropractic is how it can instantly restore strength to functionally weak muscles. It’s great fun demonstrating the instantaneous response to patients. Especially if they are a little sceptical and see us as the last resort. I am also interested in the use of specialist neurological tests to re-balance the activity of the brain following whiplash type injuries. In my opinion Chiropractic and targeted active rehabilitation should be the first port of call when you have back pain or joint and muscle pain. If you correct poor joint movement soon after injury it can help you stay active, flexible and healthier. Then you can stay fit and healthy for longer in your life. Karen Oldale BSc(HONS), MSc (Chiro), DC, PGCert, MRCC. 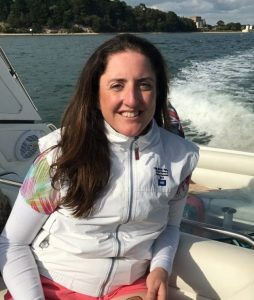 After successfully building her practice as an associate at a Chiropractic Clinic in Dorchester, Karen is now primary practitioner at Blandford Chiropractic Clinic where she has been practising since 2007. With an interest in sports injury rehab and functional neurology, she also spent time seeing patients at our Poole Chiropractic Clinic before starting a family. Karen has a special interest in functional neurology and has 13 years experience of busy practice. This has shaped her skills in dealing with people of all ages struggling with conditions such as sports injuries, dizzyness, nutrition and children’s issues. 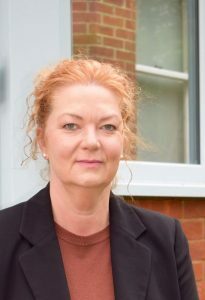 Susan has been in practice as a chiropractor for nearly 30 years and has always enjoyed the variety of what working as a chiropractor brings, whether it has been in Merseyside, Greater Manchester, Hampshire or Dorset. “I see a broad range of conditions presented by all sorts of people of all ages. I believe it is important to really listen to my patients and find out how their condition affects them and what their hopes and expectations are in order to tailor a treatment and rehabilitation plan to suit. Since qualifying as a chiropractor I have furthered my studies following my interest in neurology. Although this can mean that I see patients with specific neurological disorders, it is far from excluding ‘everyday’ conditions. Chiropractic has always been based around a neuro-musculo-skeletal model and the neurological perspective takes this to another level. Movement and exercise is healthy for the body in numerous ways. Taking the example of a fractured ankle in plaster. Obviously it restricts the ankle while the bone repairs plus our general mobility, but we also need to consider the effects on the nervous system right up to the brain, due to the loss of nerve input. Equally we can look at it the other way around and consider whether an ankle that sprained too easily might be due to misfortune, weak muscles or maybe lack of an appropriately working nervous system. Either way, chiropractic with neurological perspective and rehabilitation can help. I perform a detailed history and examination in order to assess the function of your muscles, tendons, joints, circulation, nervous system and their integration as part of your overall health. 1988 Doctor of Chiropractic Anglo-European College of Chiropractic, Bournemouth, UK. 1996 Diplomate of American Chiropractic Neurology Board. (The ACNB is fully accredited with NOCA the National Organization for Competancy Assurance in the USA). 1992-98 Chairman of Wessex Postgraduate Group (Chiropractic). 1993-99 AECC Academic Board Member. Member of the British Chiropractic Association. Member of the American Chiropractic Neurology Association. Fellow of the Royal College of Chiropractors. Registered with BUPA and AXA/PPP insurance companies.